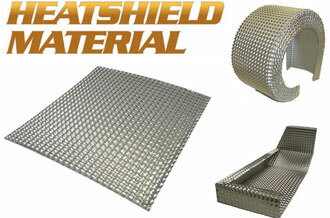 A REVOLUTIONARY HEAT SHIELD MATERIAL is now available, Its construction, consisting of a ceramic filler sandwiched between two 0.15mm aluminised steel sheets, gives a very efficient high temperature thermal barrier suitable for a wide variety of automotive and industrial applications. The unique double corrugation design allows the material to be formed into complex shapes and ensures exceptional rigidity. This material provides excellent performance in high temperature, noise sensitive applications and is available in a range of sizes. 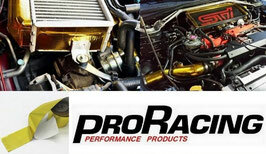 Pro Racing gold heat reflective tape is a high temperature polymer laminated glass cloth for use in extreme temperature environments. It is lightweight and easy to apply and remove. Highly effective material for firewalls, fuel cells, engine covers, under bonnet, engine compartment, bulk heads, seat bottoms – anything or area that needs protection from heat.